By Arpad Okay. Max Perlson is a time traveler. 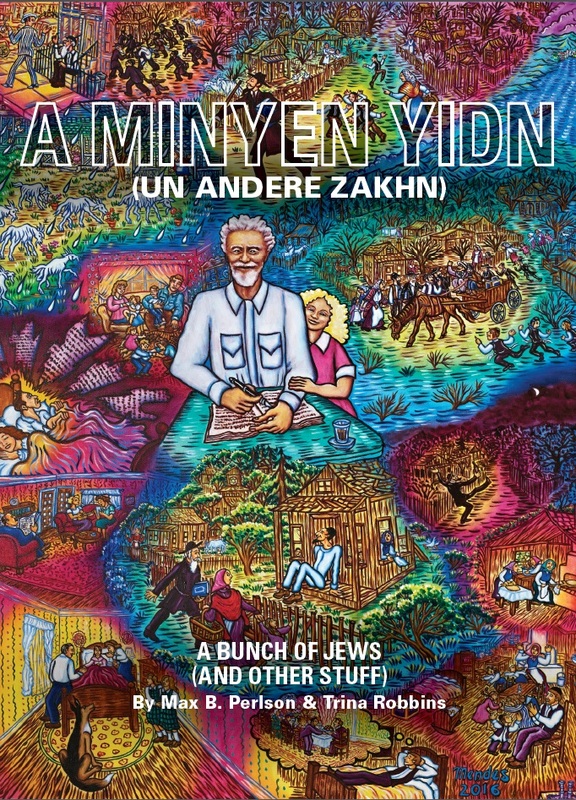 A Minyen Yidn (Un Andere Zakhn) was originally Yiddish prose, something he wrote in 1938. Perlson went from Belarus (before it was Belarus) to New York and ended up writing an assortment of fables set in his two homes. Nearly eighty years later, Perlson’s granddaughter would pull “Mutye’s” book from the ether. 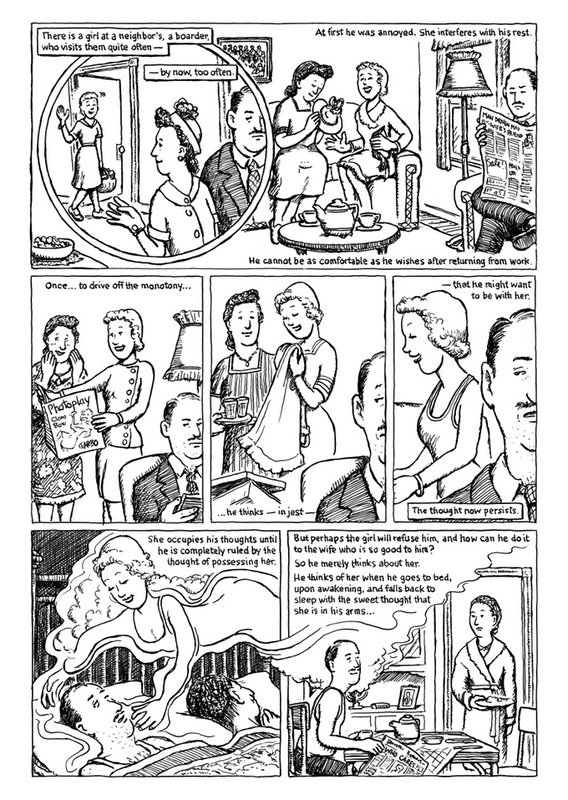 His daughter, Trina Robbins, would have it translated, adapt a comics script from it, find artists and a publisher, and give her father’s Bunch of Jews an unexpected second life. The story of the book and the stories within it both serve to remind us of how important our relationships are. Family, friends, colleagues, where our lives touch, that is the stuff of legends. So says Max Perlson. Max’s vision of provincial and domestic life is told with a classic storybook flavor in Robbins’ version of A Minyen Yidn. Small town stories about a mister know-it-all or a saint of no consequence, they blossom with fairytale grandeur, shine with casual gravitas. It transforms into a tale as tall as one should expect from a grandparent, and comes with the bittersweet feeling that often comes after. 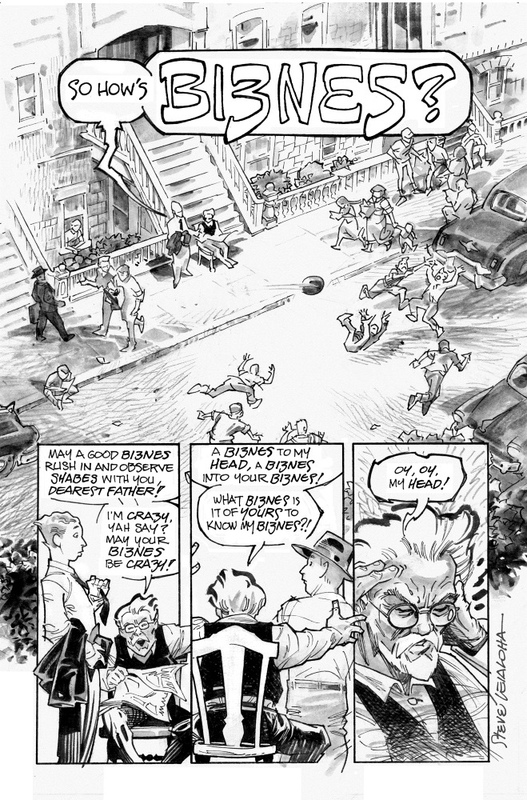 That story’s comic presents the temporary blindness of a visit to the optometrist in a Daredevil meets Dr. Seuss kind of way, and the comic that follows it couldn’t feel more different, a magnificently proportioned recipe strip. There’s no single type of story in A Minyen Yidn. Robbins has assembled a mix of artists whose styles are, like the book itself, capable of covering anything. If there is a constant aesthetic to the artwork, it is the ubiquitous cool of the underground. Outsiders who work only in monochrome. Watercolors. Retro nods to quills and woodcuts. Older styles for Old World stories, more Caldecott than Comics Code. Jazz for a New York story from the radio years. Moments of quiet beauty, like two friends sitting close at a table in “Duboy”. Some of the people that Perlson paint will barge into any panel they please, and Robbins has the wherewithal to let them. Robbins’ take on her dad’s book crackles with magic. Perlson captured his age as well as his people in A Minyen Yidn. Robbins brings both out by showing us the world the folks back home were living in. A husband reflects on his troubles during his public transit commute. A drunk rushes through a train yard. Old man on the block. Old man in the shtetl. Goat country. The indie rock feel and the source material’s armchair anthropologist love of all things local make A Minyen Yidn a surprisingly timely, hip read. Max Perlson is a time traveler. His presence in each story comes and goes with the same acumen as contemporary nonfiction authors who weave themselves into their research, like Sarah Vowell or Mary Roach. Max would have flourished on This American Life. A Minyen Yidn could be a podcast but for Perlson’s love of books. There’s a joy in these stories, but there is another joy in seeing them literally bound together forever. Perlson defies the ages because A Minyen Yidn is timeless. Fate has brought it back into the world, and making friends with Mutye is an opportunity not to be missed. Written by Max Perlson and Trina Robbins. Art by Steve Leialoha, Joan Steacy, Ken Steacy, Shary Flenniken, Sarah Glidden, Eve Furchgott, Elizabeth Watasin, Anne Timmons, Robert Triptow, Caryn Leschen, Jen Vaughn, Terry Laban, Miriam Libicki, Miriam Katin, and Willy Mendes. Additional lettering by Saida Temofonte.